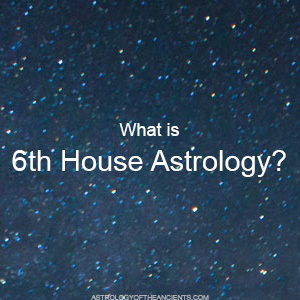 What is 6th house astrology? The sixth house is commonly known as the house of health as it covers diet, fitness, medical tests, hygiene, minor illnesses, and chronic health issues. However, the 6th house also covers your job (not your career as that is the 10th house), including your work habits and how well you get along with co-workers. While the 5th house can make you think you can be and do everything, the 6th house holds you back and reminds you that there are limits. It brings you back down-to-earth to deal with day-to-day realities, like putting food on the table and deciding whether you really can stand the person with whom you're in a super hot romance. The sixth house in astrology gives you a mind-body connection where you look both at your internal and external world. Whether it's brushing your teeth, working out, paying bills, or deciding whether something is good for you, the sixth house has an effect. This can be seen clearly in how it governs what you do on a day-to-day basis, such as a job. The sixth house has an effect on whether you show up on time, work late, meet deadlines, micromanage, and can handle a rigid schedule. Authority and leadership also come into play with the 6th house. This is the astrology house that reveals how you deal with being in charge, how you handle people telling you what to do, and how you relate to people you employ, such as a doctor or hairstylist. The sixth house even reveals how you accomplish different tasks – do you have high energy? Do you jump in the middle? Do you get calm in the face of chaos? Working too much can leave you feeling stressed and tired. Not having work can affect both your ability to eat well and your ability to afford healthcare. Thus, it's no surprise that health is governed by the sixth house in astrology as the two go hand-in-hand. Finally, the sixth house in astrology covers pets. This might seem like an obscure topic to throw in the mix, but pets are important to many people's daily lives, affecting everything from how people feel about themselves to how they adjust their daily routine to take Fido for a walk. What jobs might you excel in? What kind of relationship will you have with people at work? How do you handle priorities? How do you deal with authority – both your own and that of people above you? If you have Pluto in your 6th House, your job might be filled with all kinds of intrigue with co-workers. You can find yourself sacrificing your personal needs in order to help others. It's easy for you to become a workaholic who is very protective and private about your work. You might also find yourself drawn to alternative health, and taking great joy in researching means of self-improvement. If you have Venus in your 6th House, you're likely to find love where you work. You naturally enjoy doing things for your partner, no matter the cost. Yet, you may not choose a relationship out of love, but rather because it is the practical choice. You might find that you do well in design-oriented jobs, such as architecture or graphic design, where you can put your detail-oriented skills to use. If you have the Sun in your 6th House, you tend to identify yourself through your work. Thus, it's important that you find a job you truly enjoy. You do feel a sense of appreciation for work done well, making criticism about your work something that can be hard for you to handle. Because your sense of identify is tied to your work, your work can easily affect your health.